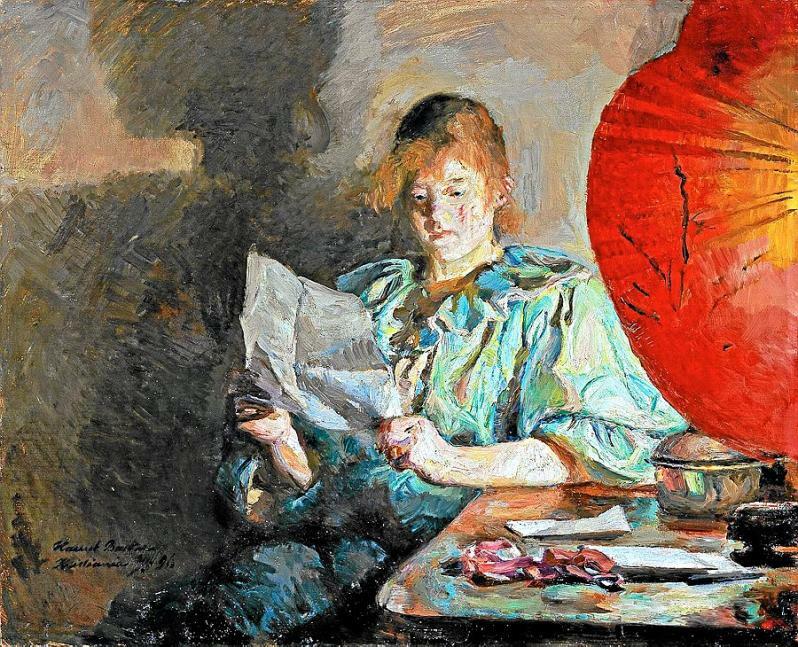 Harriet Backer (1845–1932), Aften, interiør (Evening, Interior) (Reading) (1890), oil on canvas, 54 x 66 cm, Nasjonalgalleriet, Oslo. Wikimedia Commons. The early years of Harriet Backer‘s (1845–1932) career saw her progress from her initial Salon-ready realism to a more painterly and colourful style of her personal interpretation of Impressionism. Her landscapes captured the intensity of the Norwegian summer, and she had been exploring the play of light in interiors. By 1890, her career was established, her art recognised and increasingly appreciated, and she had started to teach. She now turned her attention from the play of natural light to that of lamplight. Harriet Backer (1845–1932), Syende kvinne ved lampelys (By Lamplight) (1890), oil on canvas, 36 x 44 cm, Galleri Rasmus Meyer, Bergen. Wikimedia Commons. 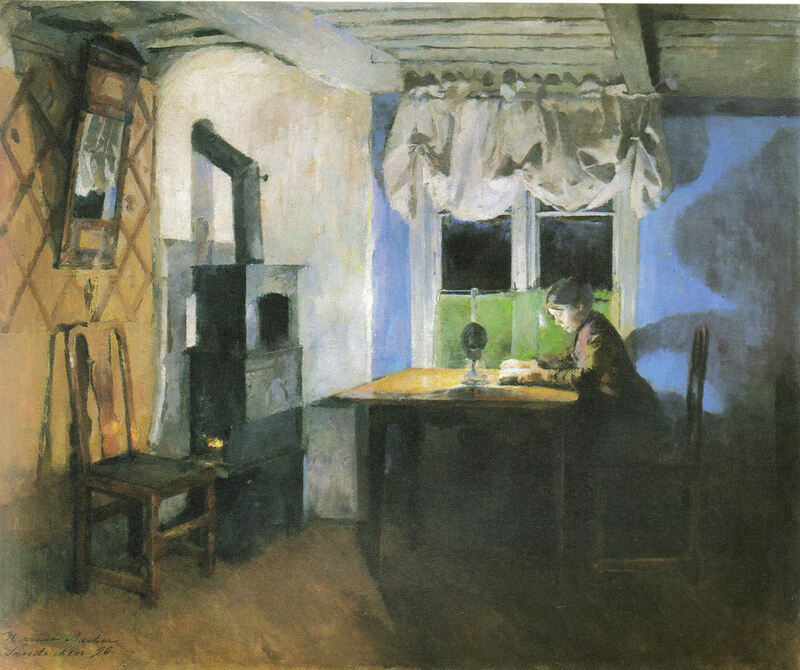 Syende kvinne ved lampelys (By Lamplight) (1890) reverses the lighting of her previous interiors. Now the view through the window is the blackness of night, and the interior is lit by a kerosene lamp on the table, inside. The play of light is changed into the play of shadow, with the woman’s shadow magnified on the wall behind her. Her Aften, interiør (Evening, Interior) (Reading) (1890) takes this further, and shows the influence of Japonisme, particularly in the scarlet lampshade at the right. Backer shows how the harsh directional light casts strange shadows, which have the effect of altering our reading of facial features, the folds in clothing, and magnifying the shadow on the wall. Although the light does not create the woman and the objects around her, by determining how we see her, it transforms our perceptions and interpretation. 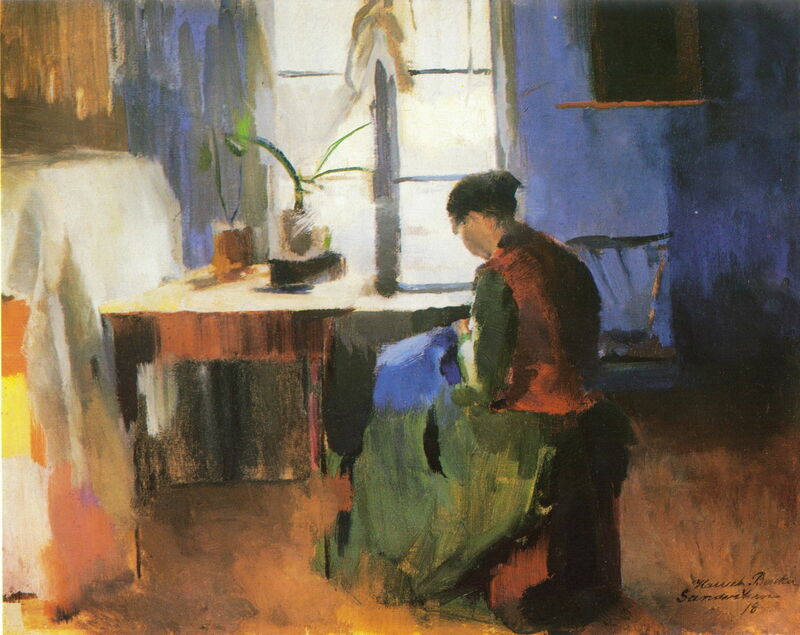 Kone som syr (Woman Sewing) (1890) takes us back to the more familiar lighting of daytime, as a woman (designated a wife in the Norwegian title) sits at her sewing. This appears to have been a quick oil sketch, with its highly gestural depictions of potted plants, table, and chair, going beyond Impressionism. However this is not a move towards abstraction: quite the opposite, as each mark represents physical reality. Harriet Backer (1845–1932), Pike ved vinduet (Girl by the window) (1891), oil on canvas, 54 x 67 cm, Private collection. Wikimedia Commons. In her Pike ved vinduet (Girl by the window) (1891), the girl looks out from the sunlit interior to a world which we cannot discern, beyond the miniature internal world of chair, stove, and potted plants. 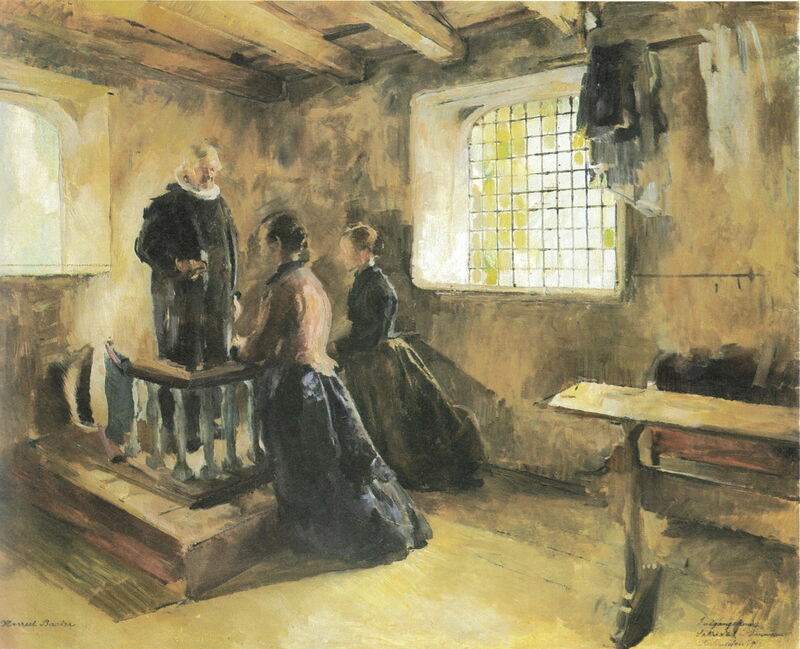 Harriet Backer (1845–1932), Inngangskoner (Churching) (1892), media not known, 90.5 x 112.5 cm, Private collection. Wikimedia Commons. Inngangskoner (Churching) (1892) shows a traditional ceremony in which a woman who has just completed the confinement following the birth of her child is received back at church, where she gives thanks for the survival of her baby and herself, and prays for their continuing health. This is believed to show the sacristy to the left of the altar in Tanum Kirke, in Bærum, Norway. Backer marks this important moment in a mother’s life with the light of hope, showing the emergence from the suffuse light of the nursery. Harriet Backer (1845–1932), Barnedåp i Tanum Kirke (Christening in Tanum Church) (1892), oil on canvas, 109 x 142 cm, Nasjonalgalleriet, Oslo. Wikimedia Commons. 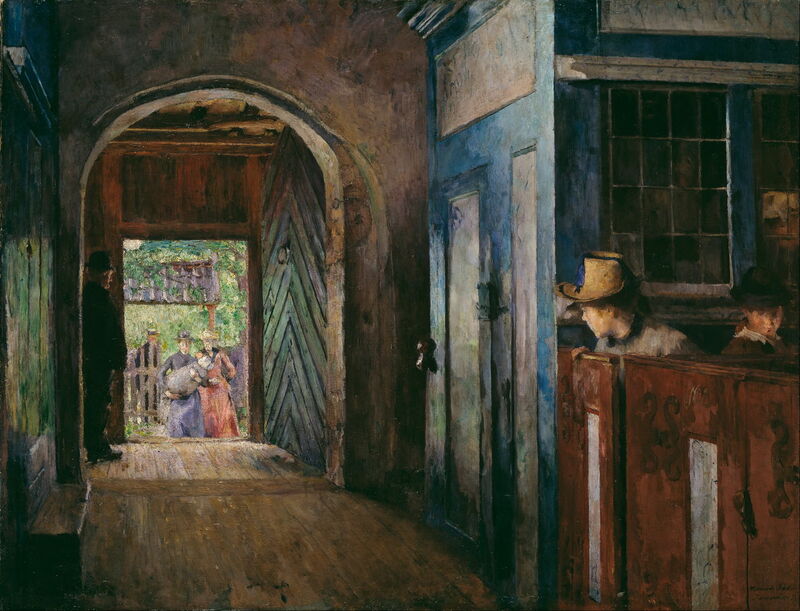 The next event in the life of mother and baby is shown in her Barnedåp i Tanum Kirke (Christening in Tanum Church) (1892), one of Backer’s most sophisticated and greatest paintings which must rate among the finest paintings in Post-Impressionism. Again, she places the viewer inside, looking now both outward and inward. The left of the canvas takes the eye deep, through the church door to the outside world, where a mother is bringing her child in for infant baptism. The rich green light of that outside world colours the heavy church door, and its inner wood panelling, and the floorboards and perspective projection bring the baptismal party in. At the right, two women are sat in an enclosed stall waiting for the arrival of the baptismal party. One has turned and partly opened the door to their stall in her effort to look out and see the party enter church. Backer controls the level of detail and looseness to brilliant effect, ensuring that we always see just what she wants us to, enough to bring the image to life, but never so much that the eye is lost in the irrelevant. 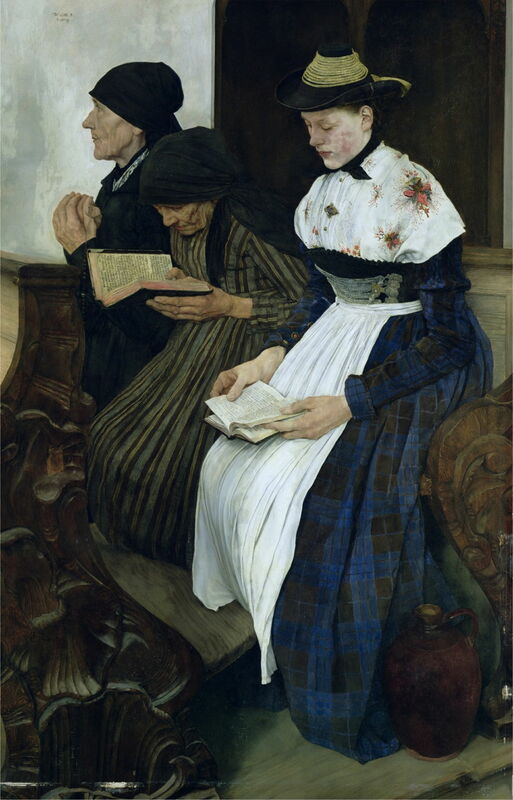 This painting is believed to have been influenced by Wilhelm Leibl’s (1844-1900) Three Women in Church (1882), which Backer had seen when studying in Munich. She considered this to be her greatest painting, and it was received favourably at the World’s Fair in Chicago in 1893. 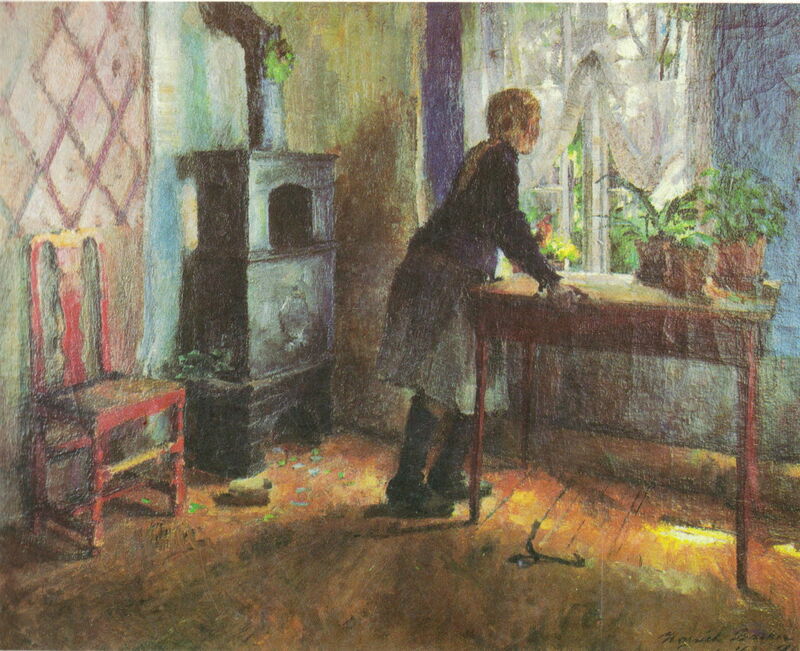 Harriet Backer (1845–1932) Gamlestua på Kolbotn (Old Living Room at Kolbotn) (1896), oil on canvas, 61.5 x 83.5 cm, Nasjonalgalleriet, Oslo. Wikimedia Commons. 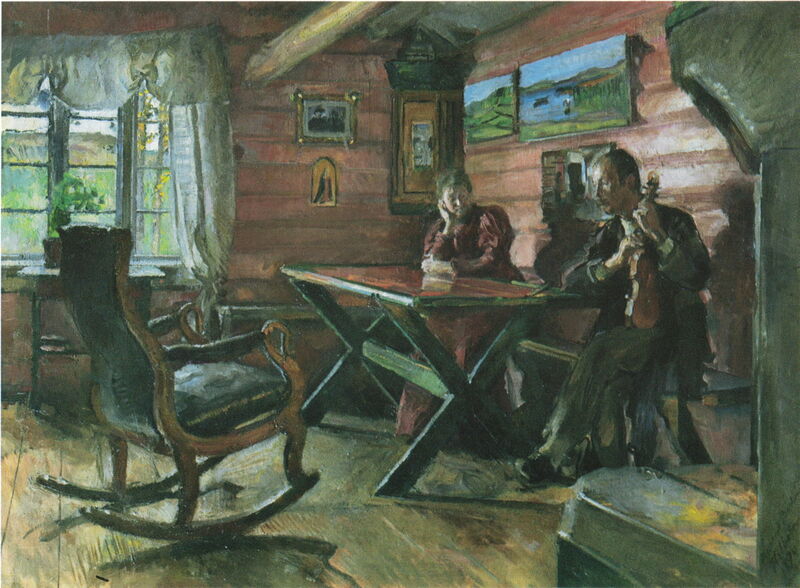 Gamlestua på Kolbotn (Old Living Room at Kolbotn) (1896) is an intimate view of a friends’ living room on their farm in Østerdalen, Norway. Hulda and Arne Garborg are seen, sat at the table, Arne holding his fiddle. Behind them are paintings, among them two landscapes painted by Backer’s friend Kitty Kielland. Kielland, Backer and the Garborgs had first met in Paris in 1885. Harriet Backer (1845–1932), Einundfjell (1897), oil on canvas, 80 x 131 cm, Bergen Kunstmuseum, Bergen. The Athenaeum. Backer had not abandoned landscapes, but they too had moved on from regular Impressionism. 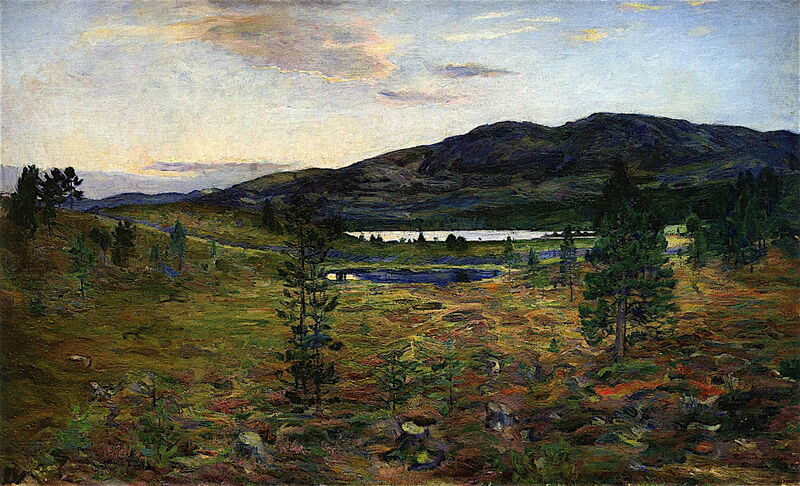 Einundfjell (1897) shows her skills in capturing the more subtle light and colour of twilight. The bright surface of the distant lake separates the dark hills behind from the more colourful meadows of the foreground. 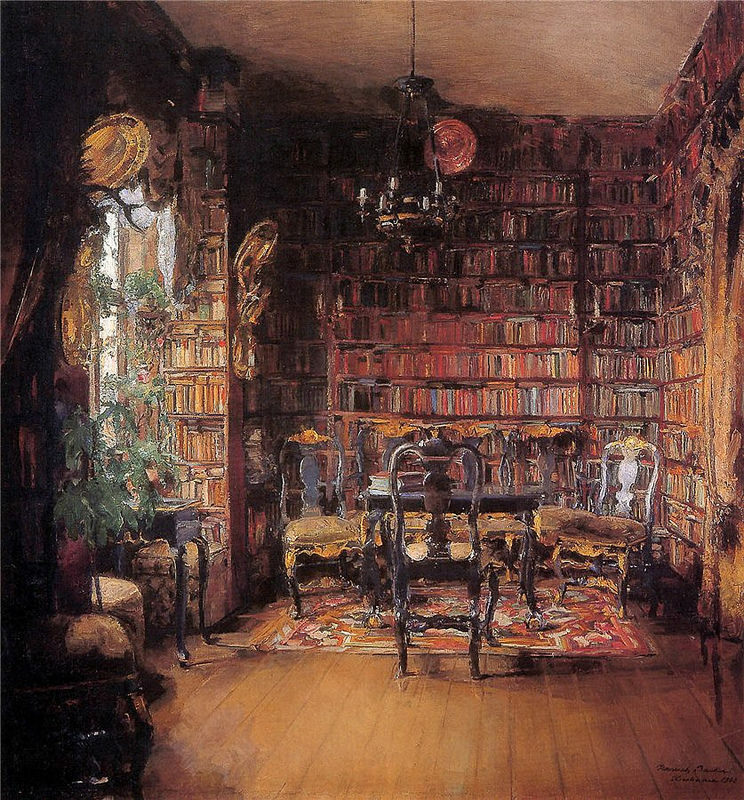 Harriet Backer (1845–1932), Thorvald Boecks bibliotek (Thorvald Boeck’s Library) (1902), oil on canvas, 94.5 x 89 cm, Nasjonalgalleriet, Oslo. The Athenaeum. Thorvald Boecks bibliotek (Thorvald Boeck’s Library) (1902) is one of Backer’s few interiors which is devoid of people, here replaced by books from floor to ceiling. The intricate detail of their many spines, furniture, and other decorations contrasts markedly with the bare floorboards in the foreground. In 1907, Backer had her first solo exhibition in Oslo. During the first decade of the twentieth century, her interiors switched away from the intimacy of the rural home, to those of Norway’s country churches. Harriet Backer (1845–1932), Uvdal Stave Church (1909), media not known, 115 x 135 cm, location not known. Wikimedia Commons. Of the many wonderful later paintings that she made of church interiors, the finest must be Uvdal Stave Church (1909). Stave churches were once numerous throughout Europe, but are now only common in rural Norway. Their construction is based on high internal posts (staves) which give them a characteristic tall, peaked appearance. Uvdal is a particularly good example, dating from around 1168. As with many old churches, its interior has been extensively painted and decorated, and this has been allowed to remain, unlike many painted churches in Britain which suffered removal of all such decoration. Backer’s richly-coloured view of the interior of the church is lit from windows behind its pulpit, throwing the brightest light on the altar. The walls and ceiling are covered with images and decorations, which she sketches in, again manipulating the level of detail to control their distraction. 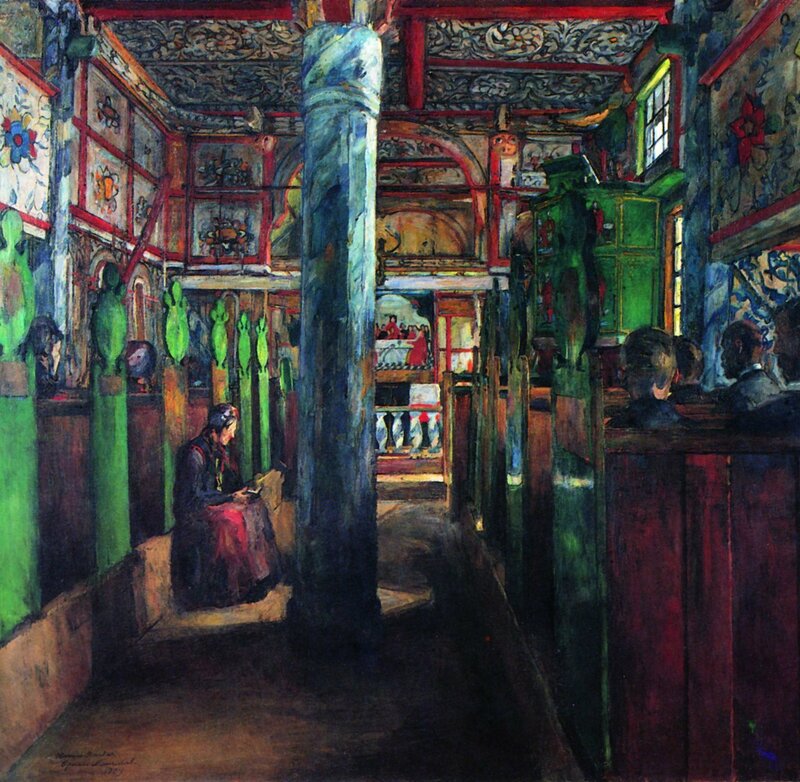 Slightly to the left of centre the main stave is decorated with rich blues, divides the canvas, but affords us the view up to the brightly lit altar. To the left of the stave a woman, dressed in her Sunday finest, sits reading outside the stalls. This is an expression of Backer’s own deep religious beliefs, her career-long exploration of lit interiors, and her profound love of her native country and its people. In 1912, the year that she retired from teaching, she was awarded the gold King’s Medal of Merit, and in 1921 was made the State Laureate in Painting (Statens kunstnerlønn), an appointment previously held by Henrik Ibsen and Edvard Grieg. She was the first woman to be so appointed. She is known to have completed about 180 paintings in all. The strength and weakness of Impressionism is the Impression: a visually startling image which concentrates on the immediate and superficial. Harriet Backer’s paintings take the viewer beyond such instant optical gratification, into her discourse between the inside of our lives and living spaces, the light that renders them in our mind’s eye, and the outside. It is one of the great painterly discourses, and one which deserves to be much more widely known. By any standards, hers are great paintings, and masterly art. Many of her best paintings are in Nasjonalmuseet, Oslo, and viewable online. Posted in General, Painting and tagged Backer, Impressionism, japonisme, Leibl, Norway, painting, Post-impressionism. Bookmark the permalink.